morning news a while ago. This next story came to us from Enid Vallis in Naramata British Columbia. This is Enid’s story about friendship. “Nancy and I became best friends two weeks after I moved into the big house on Duncan street. She appeared at our door one morning wearing one of her smocked dresses, her braids tied with crisp ribbons and introduced herself to my mother. The year was 1941 and we were both five years old. Nancy and I became fast friends. We both had vivid imaginations so every day was an adventure. We played house, school and office. We loved to colour and bake mud pies in the sunshine. One day we came up with a wonderful idea – every Monday for the rest of our lives we would give each other a gift. My first gift to her was a ring with a blue stone. It cost five cents – half of my weekly allowance. Oh the excitement the first Monday we exchanged small boxes! What gift would I get from Nancy? A ring? A broach? A hair ribbon? 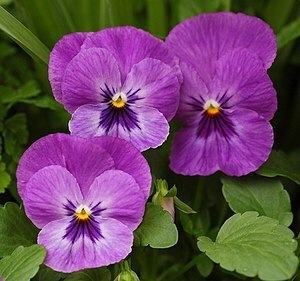 But all I found in the box was a flower – a dark purple pansy resting on a bed of cotton batting. “It’s just a pansy,” I said, disappointment in my voice. I can only remember two other gifts I bought for Nancy with my pennies – a hair clip with bluebirds on it and a “genuine” cricket clicker. I can’t recall any of the others. But I can remember what she gave me: Half a newly hatched robin’s egg, a special hiding place in Mrs. MacKenzie’s hedges for those summer games of hide and seek, a nest of pink naked baby mice in an old crate in the storage shed – we sat as quiet as mice ourselves and watched them and a spider’s web, under construction. One very special gift was letting me sit on her private branch of the huge birch tree in her back yard. I looked up to see the sun falling in bits and pieces through the leaves and looked down to see the patterns of sun and shade on the grass. I heard the ocean for the first time in a cowrie shell in her father’s study and saw the sunset through the rose coloured glass of the round window on the front stair landing. “But they are not real presents,” I insisted. And as a result Nancy and I had a falling out over the whole thing. It was a nasty, name calling fight that five-year-olds excel at. We canceled the “best friends for life” clause and I went home and ground the robin’s egg into a fine blue powder.